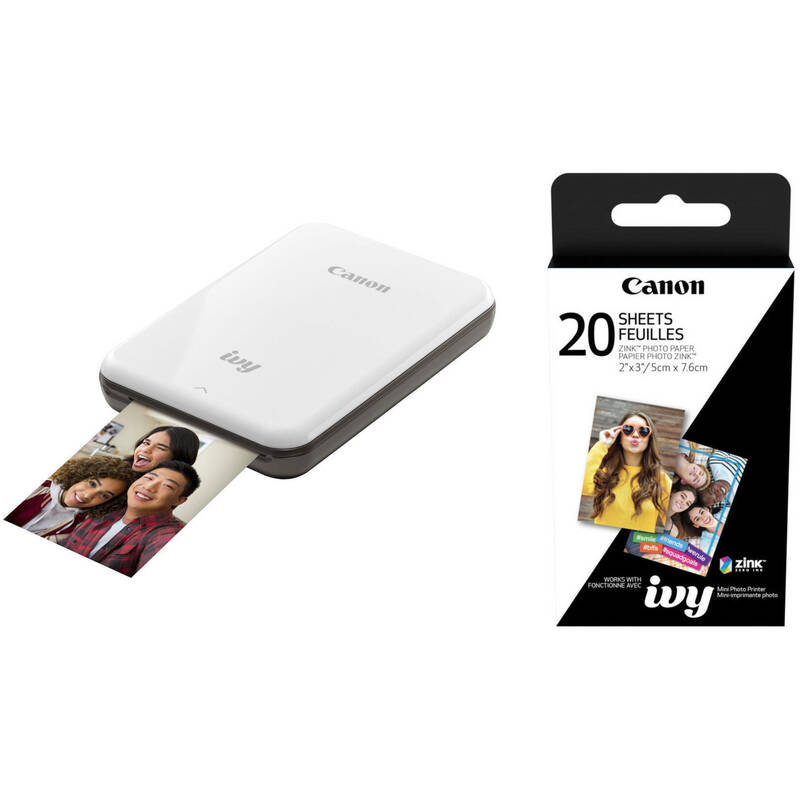 This B&H Kit combines the slate gray Canon IVY Mini Mobile Photo Printer with 20 sheets of their 2 x 3" ZINK Photo Paper. This printer/paper combo allows you to create colorful prints virtually anywhere you are. A notably compact offering that is less than 1" tall, this slate gray IVY Mini Mobile Photo Printer from Canon allows you to easily print pictures off a compatible phone or tablet. It runs on a built-in rechargeable battery and uses Bluetooth connectivity to pair with your iOS or Android device, eliminating the need for cables except when charging. The unit can fit in a small bag or backpack, or even your pocket, so you can create vivid images no matter where you happen to be. The IVY makes use of ZINK Zero Ink printing technology, which applies heat to different layers of dye that are already inside the paper to form an image without any ink or toner involved. Only the special media is required, which results in 2 x 3" borderless images and features a peel-off adhesive backing so you can easily display your pictures. Due to the lack of ink, the paper is naturally smudge-proof and resistant to water damage. For managing your images and sending jobs to the printer, the Canon Mini Print mobile app is available as a free download. This app can customize your photos by adding filters, frames, or even emojis, and also allows you to pull images directly from social media for printing. The printer reaches speeds of up to 50 seconds for a single picture and can create approximately 20 prints when fully charged. Box Dimensions (LxWxH) 5.55 x 4.25 x 1.35"